"Teamwork, Vision and Strategy Make a Green District Greener"
It takes time to get buy-in for change. But the time is ripe right now for these types of changes at schools, so expect great things to happen! Michael Brady is Asst. Superintendent for Business Services. Margaret Ovendon is a parent. Our small school district has 3 elementaries, a middle school, and two high schools. Before 2008, green efforts had emerged independently at some of the schools. These included school gardens, no-waste lunch campaigns, and, at one elementary, an environmental club. But without coming together to develop district-level policies, there were many issues that these independent efforts couldn’t address. In the spring of 2008, parents organized a “Green Schools” event, inviting Deborah Moore of the Green Schools Initiative as the guest speaker. A concerted effort was made to have “greenies” from all 6 schools in attendance, as well as administrators, teachers, and City of Piedmont officials. After Deborah’s presentation, we brainstormed ideas for how our schools could “go green.” Over the summer, the association of parents’ clubs identified representatives for Green Committees for the schools that didn’t have them yet. At the beginning of the school year, these representatives met with the Assistant Superintendent in charge of facilities. With his help, a PUSD Green Initiative Committee was formed, with representation from administrators, teachers and parents from all of the schools, as well as students (high and middle school) and the custodial union. This district-wide committee developed a 7-point Green Policy, which was approved by the School Board in February. Over the next three years, the goal is to address all 7 points. This year the issues we tackled were: sustainability in construction (related to earthquake retrofit as well as new school construction projects that are underway); landscaping and grounds (IPM, water conservation, and other “bay friendly” measures); as well as waste reduction (implementing the City of Piedmont’s new green waste and recycling collection program at the schools). Issues coming up on the agenda are: energy conservation, climate action (in concert with the City of Piedmont’s climate action plan), environmentally preferable purchasing and environmental education. An important accomplishment this past year was getting ourselves organized and institutionalizing the planning process for greening our school district (as described above). At the same time, individual schools still have their own, unique green initiatives (such as gardens, student groups, Green Committees), and coordinate and share information around events such as International Walk to School Day and Earth Day. Being in touch with each other and learning from each other’s experiences has been invaluable. This year the three elementary schools successfully piloted lunchtime green waste and recycling collection programs, with one school (Havens) diverting around 3 tons of waste from the landfill. In 2009-10 we will start extending this program out into the campuses of two of the elementaries, and the Middle School will begin composting its own lunchtime green waste. Discussions with PUSD’s head groundskeeper led to ideas for how to reduce pesticide usage (already low) by getting more volunteers involved in mulching, as well as ideas for how to reduce water consumption. In addition, the three elementaries collaborated in planning Walk to School Days in the fall and spring. 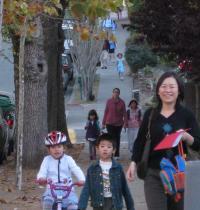 At Beach Elementary, 73% of students walked, biked or scootered on those days (compared to around 57% on “normal” days). The PUSD Green Initiative Committee is comprised of administrators, superintendent, school board members, custodial union representatives, teachers, parents, and middle and high school students. There are about 20+ members, and the meetings are open to anyone interested. There are middle and high school student representatives to the PUSD Green Initiative Committee. These students were selected by teachers from those schools. This year high school students formed an Environmental Student Union, which organized an Earth Week in May. At the elementary level, students were quick to embrace the new green waste and recycling collection program. Students from 4th and 5th grade leadership groups served as waste monitors, helping the younger students with sorting their trash. At one of the elementaries, Wildwood, there is an afterschool Environmental Club (led by parents). Next year at the Middle School there will be a new elective called the “Green Team” for 7th and 8th graders. There will also be a “Green Education” class that every 6th grader will take. We have been organized district-wide for a year. But the elementaries have had school gardens and green awareness activities for several years. It was clear that the desire to “go green” was strong across the school district. All that was needed was a space for people to communicate with each other and work together. Be patient. It takes time to get buy-in for change. But the time is ripe right now for these types of changes at schools, so expect great things to happen!